Spanish for Teachers & Spanish Teachers | Total Language Immersion in Costa Rica & Ecuador – Earn CEUs and PDUs! Consider 10 days to have a full weekend to explore! Optional excursions to our favorite beaches, active volcanoes & more! Amazing day trips to experience local culture, see the equator, hot springs, etc. *All programs in Nicaragua are currently paused pending resolutions to political unrest. Contact Us if you would like to discuss. 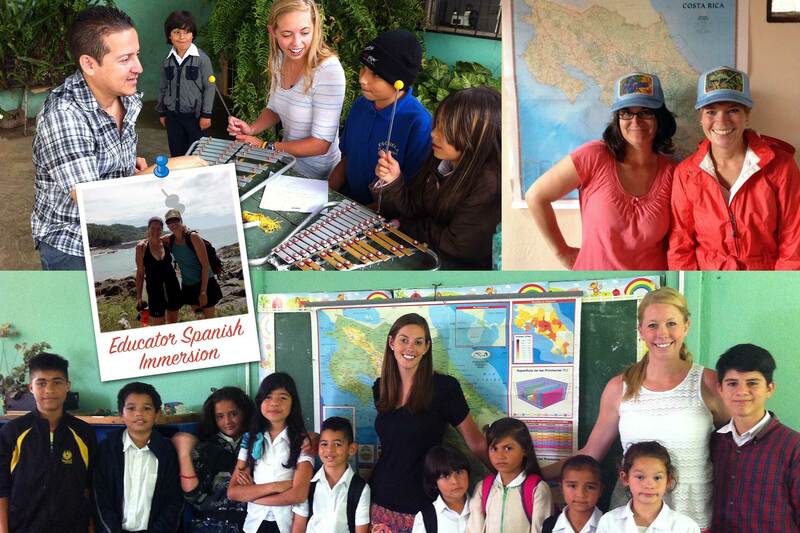 Spanish for Educators Summer Immersion Program for Teachers in Costa Rica & Ecuador! Whether you’re a Spanish teacher or a classroom teacher, you will not find a more integrated and supported program for your Spanish language learning needs! This program is inspired and implemented by educators and for educators. Program planning, host family coordination, language classes and leadership are designed intentionally for YOU the educator! Read what our participants have to say about this program! I would say that my time in Costa Rica had truly met or exceeded all of my expectations! I came down knowing only a few words, and after three short weeks, I’m leaving with the ability to communicate in Spanish with my students and their parents – what a gift! I’ve also gained so much by being immersed in this culture and truly believe I will be a better teacher in the future because of it. Why should I choose Common Ground Spanish Immersion Program for Teachers and Spanish Teachers? When you travel with Common Ground, you are not on your own. At a very minimum, you have the CGI onsite coordinator with your during your whole trip. Additionally, you will work closely with one of our lead Spanish instructors for at least a portion of your trip. We in country to support you! Preparation is essential for establishing clear expectations for your trip, staying safe while you travel, knowing the day to day plan, and positioning yourself and your Spanish for maximum success on your program. Our custom pre-departure course is an amazingly effective online course that connects you with your fellow travelers and prepares you for every single detail – including culture shock! We’re a Colorado-based organization with a clear track record of amazing Spanish immersion programs. You can call us up at any time, speak English (or Spanish), and get your questions answered immediately. That’s worth its weight in gold! What type of teacher is this program for? Classroom teachers with a high percentage of Spanish speakers that need to learn how to communicate with their students, parents & guardians. For many classroom teachers, Spanish has become an extremely helpful tool to connect with Spanish-only parents; and the ability to understand families on a cultural level is invaluable. Spanish teachers benefit as well! It’s easy to get into a rut with your Spanish if you’re teaching the same levels over and over every year. Spanish teachers know that every 3-5 years they should get abroad to immerse themselves in the language and refine higher level grammar concepts and reach native like fluency in everyday conversations. Our Spanish for teachers immersion program is hands down the BEST way to improve your Spanish over the summer! Spanish Immersion for Educators is specifically designed for teachers to drastically improve their Spanish communication skills resulting in more effective and successful communication with their Spanish-speaking students and families in and out of the classroom. We have a problem…Today, teachers are graduating with cutting edge methodology and training to teach their students, HOWEVER…considering the growing Spanish speaking population in the US…many educators lack the Spanish language skills they need to successfully and effectively manage their classrooms, communicate with their parents and improve outcomes of LEP populations in their classrooms. This Spanish Immersion Program for Educators equips teachers with the Spanish speaking skills and cultural understanding they need in order to successfully and effectively work with their populations. This program was designed by Spanish teachers for teachers that need to: improve their Spanish, better serve their educational communities, and break down language barriers. Whether you are a classroom teacher with a high percentage of Spanish speaking families, a dual language immersion teacher that needs a deeper knowledge of the language and culture, or a Spanish teacher that needs to brush up on native skills, this program is for you. 20 hours a week of communicative Spanish classes that are customized for educators. All participants must take both a written and oral entrance exam to get placed in the correct starting level. As noted above, “Spanish for teachers” can mean a couple of things: Spanish for classroom teachers or Spanish for Spanish teachers. During the pre-travel period, you will define for us which type of Spanish immersion you’d like your classes to focus on. Our Spanish for classroom teachers curriculum revolves around classroom management and parent conversations in Spanish. Our Spanish for Spanish teachers curriculum focuses on refining higher level communicative proficiency in Spanish, and/or it can include a focus on tips and techniques for teaching Spanish back home. Educational service projects (10-12 hrs. per week): where participants deliver educational topics in our outreach projects to underserved communities with identified educational needs. Participants also visit local schools and interact with local teachers. practice and improve your Spanish in an educational setting and a real life context. Not only will the community service activities help meet the needs of the under-served, but they also require teachers to be using Spanish in a practical context to meet certain objectives. This is an important piece to your language development and improving your Spanish. We generally volunteer between 9 and 12 hours per week. Living with a local host family: participants are immersed in speaking Spanish 24/7 and acquiring Spanish as they relate to the host family and experience daily culture in Central and South America. We recommend host family stay to complete the 24/7 immersion aspect of the program, your general Spanish conversational skills will sharpen quickly! Of course, you have the option in both Costa Rica and Ecuador to stay on your own in a hostel or hotel. You will miss out on some conversational Spanish, but if you need your private space, you can certainly get it. Continuing Education: Continuing Education Credits (CEU’s) and Graduate Level Credits (PDU’s) are available for an additional cost for teachers who would like to apply for them. Learning Spanish well is not a quick endeavor. If you truly want to make progress on your Spanish skills, we suggest a minimum program length of two weeks. Costa Rica: June 29 – July 6, 2019. Optional cultural classes: salsa, merengue, cumbia dancing classes, and learn to cook like your mamá tica! Visit various precarios in the outskirts of San José, Costa Rica and develop educational charlas that help the communities improve quality of life. Work directly with kids and teachers in local schools. Practice and improve your Spanish in an educational setting and a real life context while volunteering to help meet the needs of the underserved in educational communities. Optional weekend excursions to travel with other participants! Costa Rica: June 29 – August 3, 2019. Costa Rica Only Program: June 29 – August 3, 2019. Registration is OPEN and space is LIMITED! Deadline to register May 1st OR when filled! Why does learning Spanish even matter? 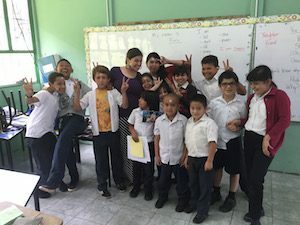 When you learn Spanish on immersion with Common Ground, you learn it by participating in a well-rounded total Spanish immersion context that includes educational outreach work in underserved communities), Spanish classes tailored and differentiated for teachers, host family lodging and weekend adventures. You work hard and you have a lot of fun; but the bigger picture, the real reason that we invite you to participate in this Educator Spanish immersion trip, is that you take Spanish back to your home community and you have a bigger impact in the lives of your students for a lifetime! How is this program different from other Spanish immersion programs abroad? Common Ground’s Spanish immersion program for Educators is unique in several ways from other options available to teachers. Primary, the differences relate to pre-trip preparation, integration into the local communities and the type of educational outreach work we do, out-of-class learning experiences, and program supervision. If you’re not sure how to choose between the programs you’re considering, we’ll also be happy to give a free comparison/contrast with any other program you’re considering. It will be our pleasure to help you make a well-informed decision on which program will be best for you. Who usually travels on this Spanish for Educators Immersion program? We accept teachers and students preparing to be educators from across the country. While everyone has unique specialties and varying professional aspirations, the one thing that EVERYONE has in common is a sense that they need Spanish for their work. Regardless of your teaching speciality, our goal is to match your expertise with a need in the communities where we work to benefit the local population. We have a small team of teachers that help supervise our programs in Central America and ensure that our outreach work remains ethical, accurate, and applicable to the local populations that we serve. How can I prepare for this Spanish Immersion? Preparation is one of the key elements of our Mission Statement for responsible international outreach work. You can and should be preparing as much as possible with your Spanish language before traveling. As mentioned elsewhere, beginners are accepted onto the programs without hesitation – however you will never regret a single minute of Spanish preparation before you travel. There is a truism when it comes to language immersion programs: the more you know before you travel, the more you learn while abroad. The reality is that the stronger your foundation is in Spanish before participating in a program, the more you have to build on when you are in-country. You will also be joining a series of live webinar meetings online to help you prepare for logistics and plan the outreach work that you’ll be participating in. We typically have 4 meetings in the 2-4 months preceding a program that systematically help you prepare for your travel. As well as an online pre-departure course. Can I join if my Spanish is beginning level? Yes, of course. Our Spanish Immersion Program is designed to improve your Spanish while you help communities with specific needs. We strongly believe that improving your Spanish proficiency is key to providing enhanced service to your Spanish-only students, parents, guardians in your home community. As a beginner, you face frustrations and challenges that intermediate and advanced level speakers don’t face (it takes you longer to get comfortable with your host family, you strain harder to follow conversations and presentations that we receive, and you work harder to develop and facilitate your charlas) – but it’s totally worth it and every trip beginners thank us for allowing them to participate because they can’t believe how much progress they’ve made with their Spanish. How are the facilities chosen where we will be working? We work with a few different non-profit groups and schools that focus on bringing education and enrichment to the poor and under-served in several different communities around the Central Valley of Costa Rica and the Cuenca & Quito areas of Ecuador. We spend significant time in schools or other public meeting places in these communities to deliver our workshops and respond to the identified needs of the community. For more information on our guiding principles for work abroad, please see our mission statement. During your pre-departure course, we may ask you to collect both physical and financial donations for your work on immersion. Your donations will relate directly to any charlas that you will be giving in select communities. For example, if you’re giving a talk on oral hygiene, we will suggest that your charla group try and secure toothbrush and travel toothpaste donations to accompany your charla. Other situations may lend themselves more to education materials as donations. You will receive more details on the talks you will be delivering and have the opportunity to define your own donation items during your pre-departure preparation. Of course! We’re happy to have your family join you on your immersion program. This does require some additional planning – so we will want to know that you’re thinking about bringing a spouse and/or children sooner rather than later. And these 10 questions have always guided us... they can lead you to the perfect spot too!